This is the very first rejection I ever received. I sent out a group of three poems to this publication right before my seventeenth birthday because I felt sure my genius required some outlet. How or why I chose this particular journal I can’t say. This was the days before web searches and the ease at which we research markets. I will tell you that I sent something to The New Yorker too, but never heard back. Imagine. My eagerness to publish was rooted in this theory that I was falling behind — getting ready to turn seventeen — hadn’t Arthur Rimbaud published his first collection at the tender age of only sixteen? I needed to get my publishing life started, so I thought, and to be honest I thought this route might help me find some kind of mentor. We would have some kind of clandestine exchange of letters like Emily Dickinson to Mr. Higginson. With this nearly fourteen year old letter my secret of writing poetry is revealed. I have pages and pages of quasi-confessional, obtuse lines. Some are written on the back of napkins and one scrawls across a smashed down pack of smokes. (I used to smoke too, because wasn’t that a prerequisite to writerly cool?) Back then I scoffed at the idea of fiction. “Less is more,” I chanted with a supreme ignorance. I disdained the rambling nature of fiction, I thought, and yearned for the subtlety and symbolic reach of verse. 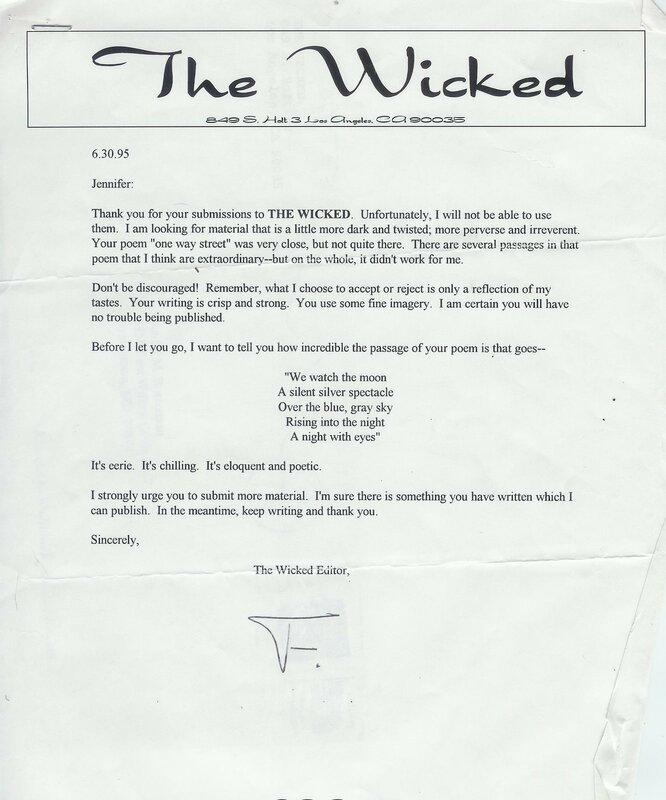 I can find no record for The Wicked still being published. It is shame really because even though I don’t know who “F” the Editor is that signed the letter I wish I could thank him/her. Back then I was crushed. I didn’t know that receiving a personalized letter that quoted my work and urged me to submit new material was such a good sign. I never did mount the courage to send anything else to him or any other publication for that matter. It was just last year that I sent a short story out, but it was electronic and all I got was a change in status. So, rejection but the kind you can be proud of.